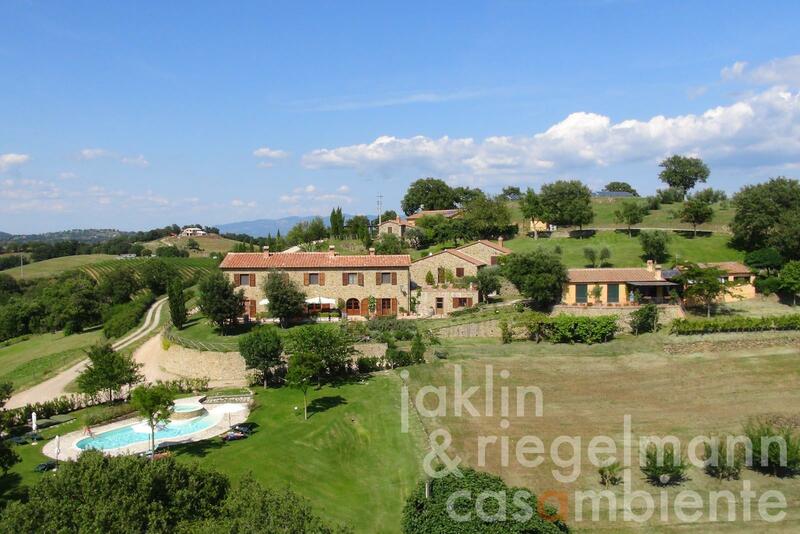 Tuscan Morellino di Scansano DOCG winery for sale in marvellous setting with panoramic views across the Maremma region onto the sea. Panoramic views from the property include the peninsula Monte Argentario, the islands Giglio, Elba and the Punta Ala headland. The agricultural business extends on 28 ha of land with vineyards, olive groves, arable land and woodland. The estate produces wine, olive oil and honey and runs an Agriturismo rental business and restaurant. The property comprises 6 buildings with a main country house (about 590 m²) on three floors, 4 buildings with guest apartments (95 m², 28 m², 75 m² and 35 m²) as well as a wine cellar (120 m²). All cellar equipment was sold and the winemaking business was suspended. All winemaking activities on the premises can be resumed anytime with new and state-of-the- art equipment. All vineyards are well-kept and grapes are currently sold to other wineries. The estate's wine production had reached about 20,000 bottles annually. All furniture, appliances and machinery are included in the sale. The entire estate is very well-kept and high-quality building works and interior fittings set this property apart. Italy, region Tuscany, province Grosseto, municipality Scansano. 28 ha about 4 ha vineyards (about 0.5 ha Morellino di Scansano DOCG, 2.0 ha Sangiovese, 0.5 ha Cabernet Sauvignon and Alicante, 1.0 ha Vermentino with a small part Traminer), 2.5 ha olive groves, 7 ha arable land and 4 ha chestnuts. Electricity, photovoltaic modules, mains water, own well water, central heating, solar thermal system, fireplace, telephone, broadband internet access, satellite-TV, irrigation system, swimming pool, private parking, terrace, vineyard, olive grove, garden, furnished.